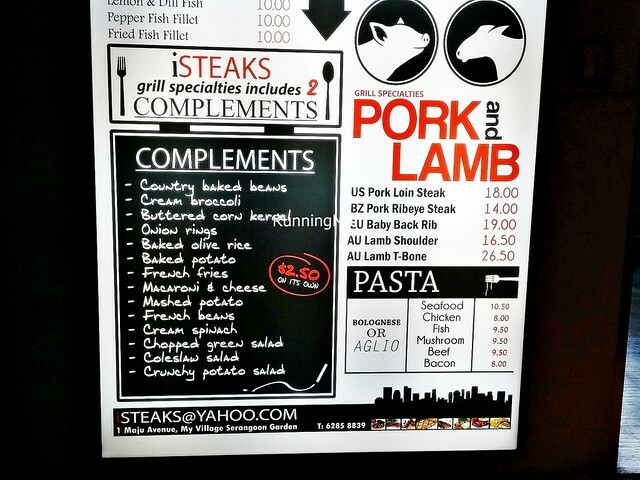 ISteaks Diner at Serangoon Gardens has been in operation for over half a decade now. Starting out as a small stall within a corner coffeeshop, selling affordable yet tasty hawker western food, ISteaks Diner saw quick success and popularity, so much so that they've since upgraded to a air-conditioned store of their own within Serangoon Gardens MyVillage shopping mall. Ambience at ISteaks Diner is modern, functional, and slightly garish, with colours of red and silver against white and black. 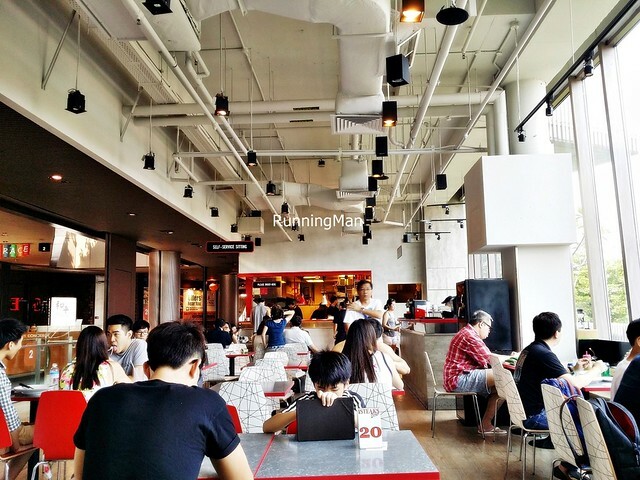 The atmosphere is akin to a casual dining place, with functional furniture that isn't too comfortable for long periods. 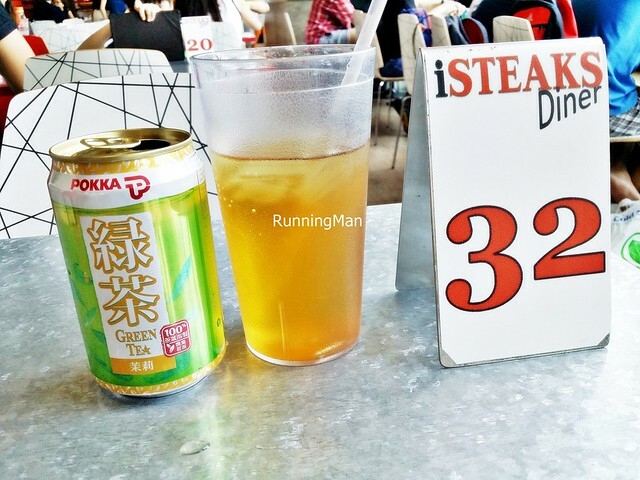 As an upgraded former hawker stall, the level of cleanliness of the interior is also below par of other cafes, there is typically a slight sense of uncleanliness here. However, ISteaks Diner has the benefit of lots of natural lighting during the day, as well as some semblance of a view of the street. Service at ISteaks Diner is largely self-service. You'll have to queue, place your orders, and make payment over the counter. Purchase of drinks is also done self-service, but at a separate counter. Collection of utensils and setting the table is also done by yourself. However, staff will help to clean dirty / empty plates and tables, though they don't perform it thoroughly. Orders are still served to your table. Staff interaction is very minimal, and on rare occasions, the wrong orders are served to your table, so do check before eating. Food at ISteaks Diner is standard western food hawker style. Portions are large, and rather generous, with each order of a main, 2 sides dishes are provided. 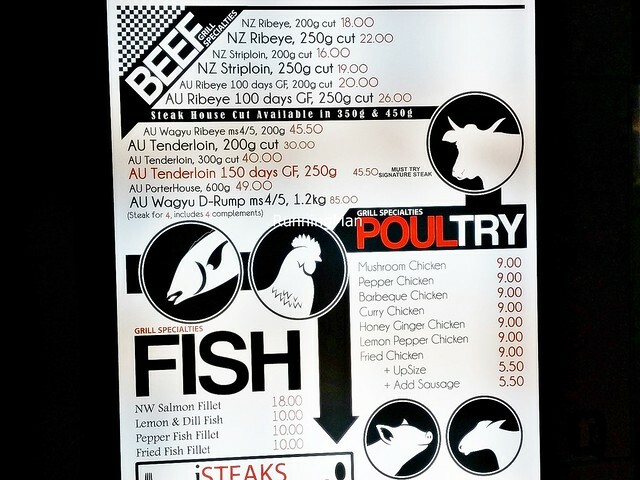 The menu is varied, with a good selection of options for both main dishes and side dishes. Taste is pretty good as well, I find each component of every dish I tried to be well executed so far. 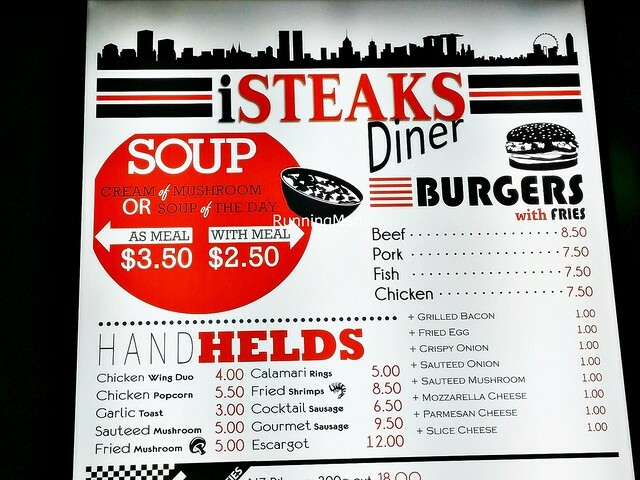 Prices are affordable and wallet friendly, budget about SGD $20 per person for a meal at ISteaks Diner, including drinks. 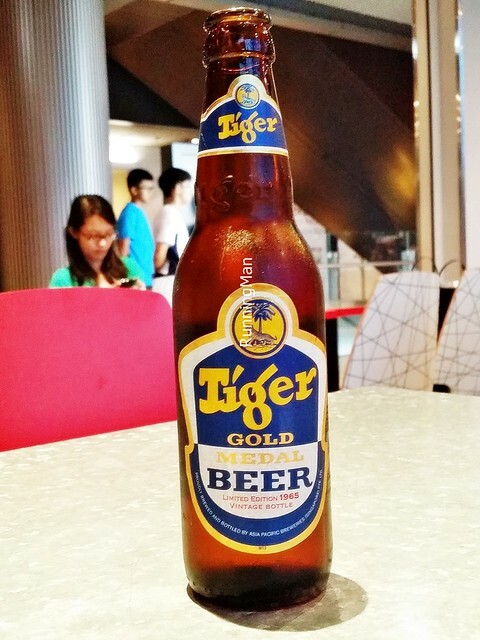 Drinks and beverages are purchased at a separate counter, with Canned Drinks (SGD $2.50) being more expensive in terms of value, as compared to a Beer Tiger (SGD $5). 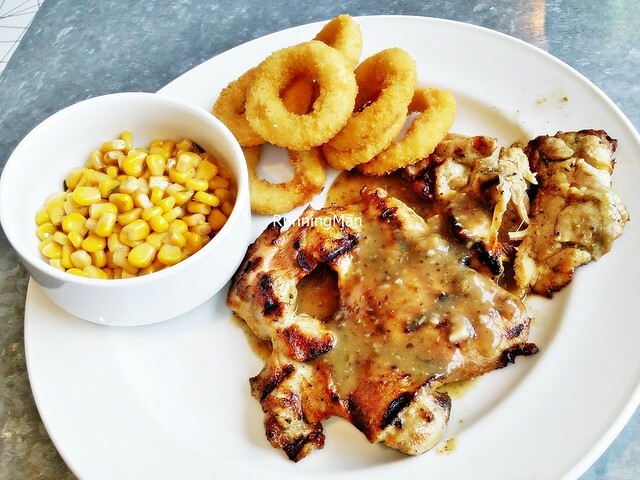 The Chicken Chop With Onion Rings & Buttered Corn Kernels (SGD $9), or Mushroom Chicken, features a tender, juicy, but rather flat piece of grilled chicken, done perfectly. 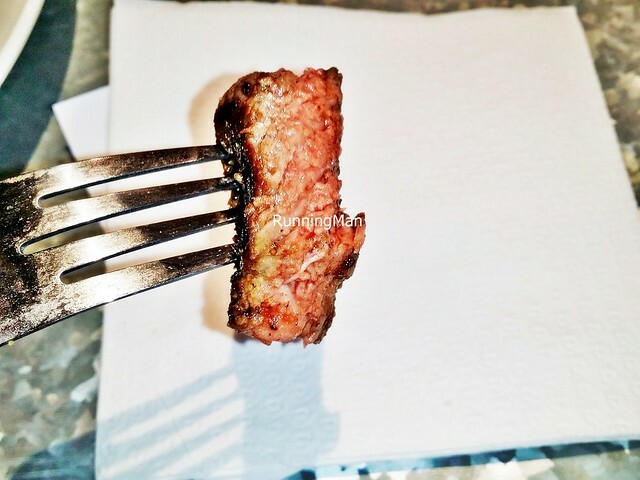 Still moist and juicy, with savoury meat that bears the aroma of the grill. Served with a slightly salty mushroom sauce on the side. The onion rings are medium sized, and have a slight crunch, but are overall rather average in taste. The buttered corn kernels are fresh and crunchy, you can still taste the natural freshness of the corn, and the butter sauce isn't heavy. 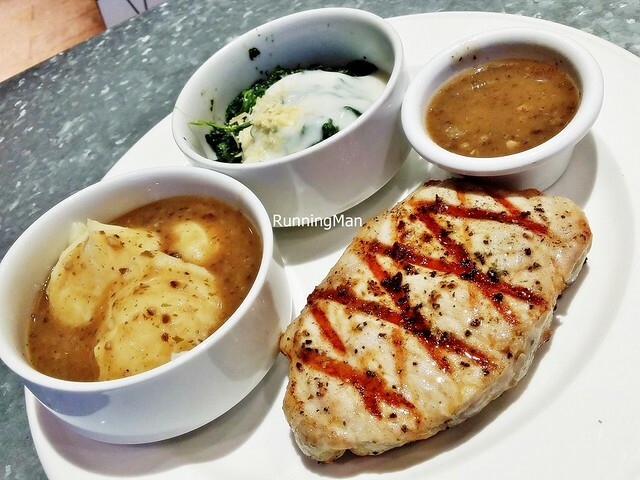 The Pork Chop With Mashed Potatoes & Cream Spinach (SGD $18), or US Pork Loin Steak, features a perfectly grilled, thick slab of pork chop. Fresh and clean, with a savoury taste, the pork is still moist, and has a thin layer of fat running along the side that is easily removed. Served with a slightly salty mushroom sauce on the side. The mashed potates are generously portioned, soft and semi-smooth with a savoury gravy, with an aroma of herbs. 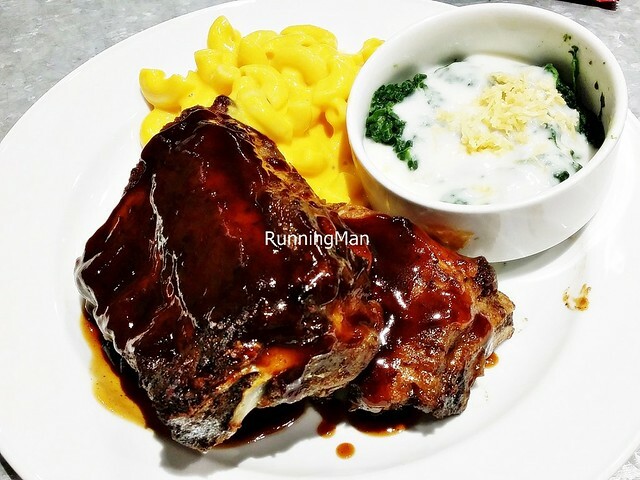 The cream spinach is nicely soft but not limp or dry, still moist, and you're able to taste the freshness, although the cream sauce is rather one-note. 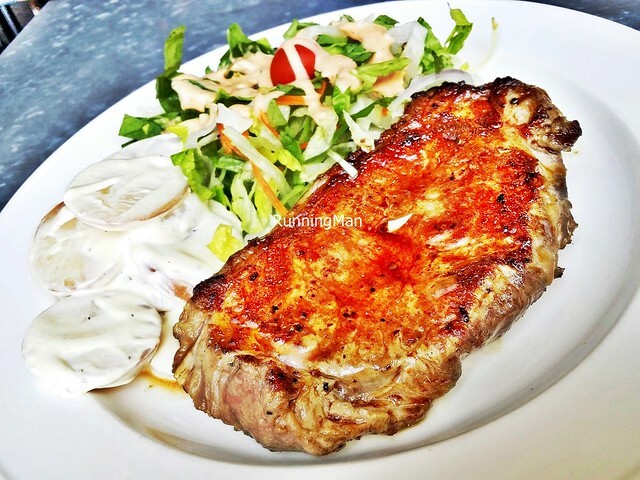 The Beef Steak With Chopped Green Salad & Crunchy Potato Salad (SGD $19), or NZ Striploin 250g, features a thick slab of beef steak, done to your liking. I got it medium well, and it turned out well executed, with a slight pink center and nice grill char on the outside. Savoury, meaty, thick, and still juicy, although slightly more resting would help the meat retain the juices better, when cut, it flows right out. Served with a slightly salty, but spicy, black pepper sauce on the side. The chopped green salad of lettuce, carrots, and cherry tomatoes lend a bright, fresh burst to the plate, and a nice textural crunch. The crunchy potato salad is aptly named, the small round discs of potatoes crunch loudly, and the thin slices keep it light so you don't feel too full. 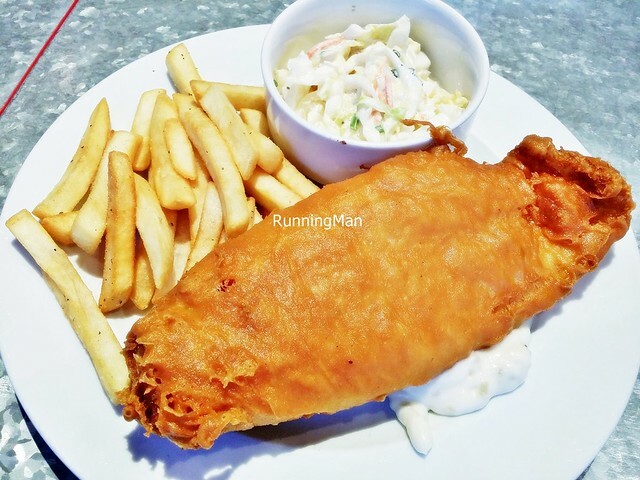 The Fish And Chips With Coleslaw Salad & French Fries (SGD $10), or Fried Fish Fillet, features a large portion of battered dory fish fillet. The fish is tender, fresh, and flakes off nicely, but I thought the batter was too thick and greasy, although it's tasty. Fortunately, the batter is easily removed. Served with a thick mayonnaise sauce on the plate. The coleslaw salad, which has strips of cabbage and carrots, is fresh and crunchy, though the cream sauce is a little too heavy. The French fries are medium sized, with a good potato flavour, and are lightly salted. 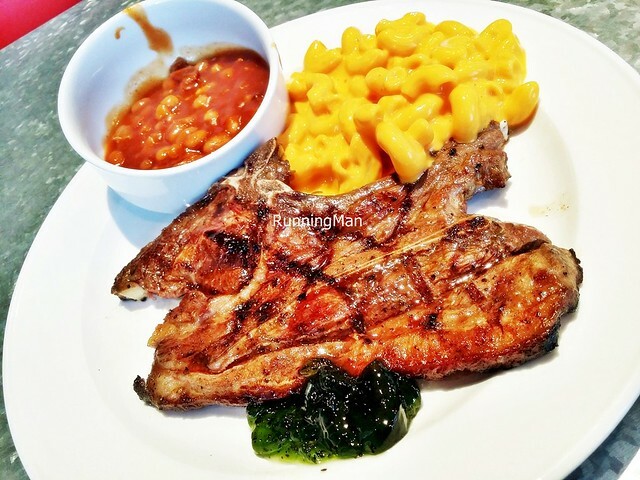 The Lamb Chop With Country Baked Beans & Macaroni And Cheese (SGD $16.50), or AU Lamb Shoulder, features a nice portion of savoury, well grilled lamb shoulder chop, with a thick layer of tasty fat that is easily removed. The lamb meat is tender, and not too gamey, definitely above average. Served with a nice mint jelly. The country baked beans are cooked together with strips of bacon, and the combination of salty against sweet is a nice contrast, plus it lends a wonderfully smoky aroma to this side dish. The macaroni and cheese features a thick nacho cheese sauce, and I like that it's not overly salty, being much lighter in taste and texture. The macaroni is slightly al-dente, with a slight firm bite, and isn't limp or watery. Not bad overall! 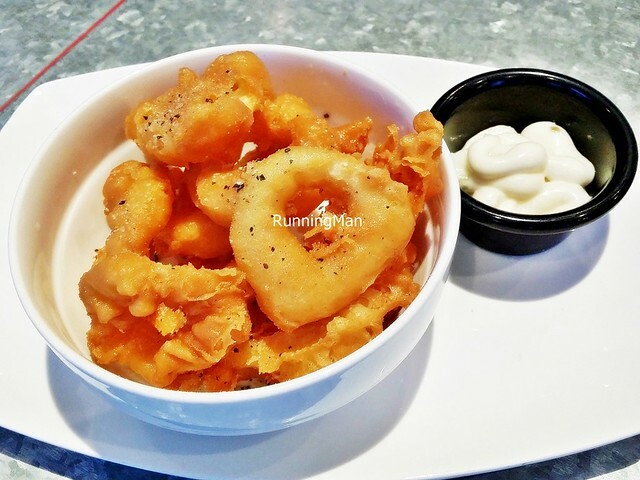 The Calamari Rings (SGD $5) feature nice, medium rings of chewy fresh squid. However, the batter is thick and greasy, though tasty. Fortunately, the batter is easily removed. Not the best I've had though. The Chicken Popcorn (SGD $5.50) was very good! 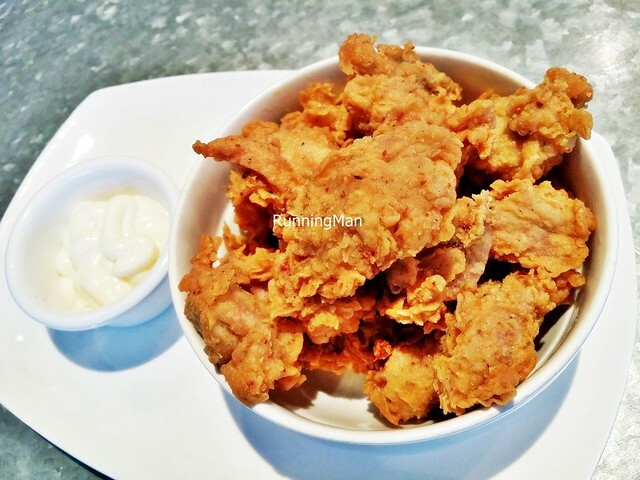 More chicken chunks than popcorn, the chicken meat is moist, tender, fragrant, and savoury, served piping hot. The skin is light and crisp, not too greasy, and crunches delightfully. Excellent! 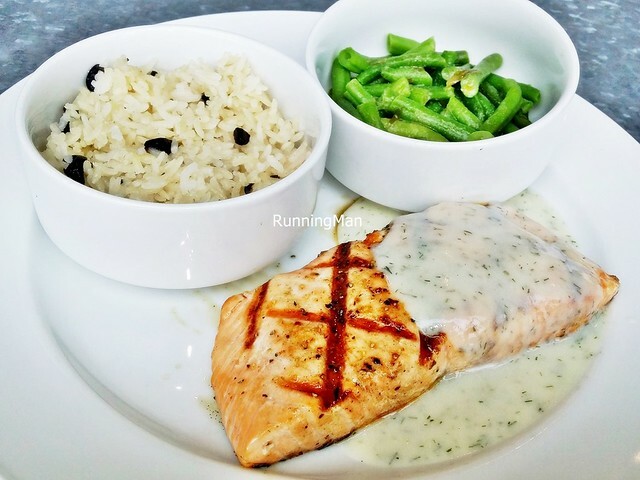 The NW Salmon Fillet With Baked Olive Rice & French Beans (SGD $18) features a fresh, thick, fillet of salmon, done to your liking. I got my salmon done to medium well, and it turned out nicely pink and moist, with tender flesh that is still semi-firm yet flakes off when sliced, and with savoury, slightly crisp skin that is oh so yummy! Served in a fresh lemon and dill herb cream sauce that pairs well. The baked olive rice is steamed together with shallots and black olives, and has taken on a savoury, earthy taste from the olives. The French beans burst with a juicy freshness when bit, although it's slightly odd served in a butter sauce, and has a slight astringent aftertaste. 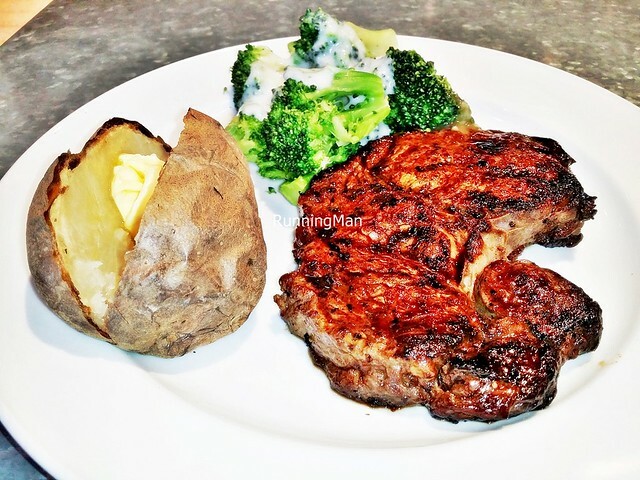 The AU Ribeye 100 Days GF 250g Cut With Cream Broccoli & Baked Potato (SGD $26) features a very good cut of beef steak, whose high quality is evident in the taste. I got mine done medium well, and it came perfectly done, with a slight pink center, nice smoky char on the outside, yet still juicy. Super tasty, most prominent in the layers of fat and marbling, which has a beefy, meaty, savoury taste, yet with a layer of wheat and grains. The cream broccoli is just as good, firm and juicy, with a delightfully fresh crunch, though the cream sauce is a little light. The baked potato however, is hard, dry, and bland. Even the knob of butter within does little to save it, you actually have to sprinkle salt and pepper over it to make it edible. Easily the worst side dish choice here, I found myself wishing there was some sour cream and bacon bits on top! 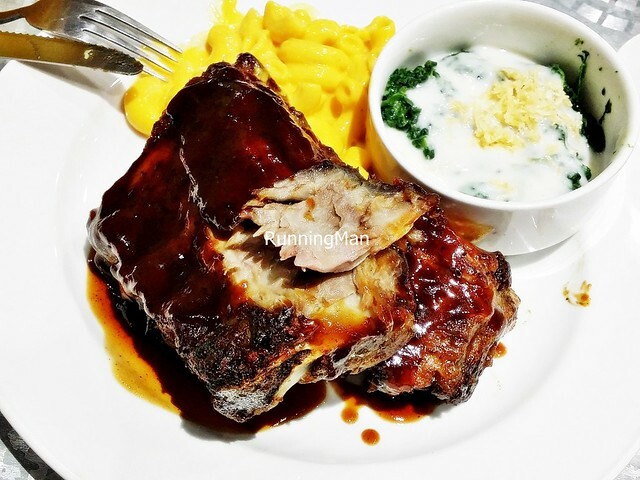 The EU Baby Back Ribs With Cream Spinach & Macaroni And Cheese (SGD $19) had tangy, sweet, sticky barbecue sauce was which very tasty! But it was sorely let down by the distinct gamey (not fresh) taste of the pork, and the texture wasn't as tender as it should be, being more firm than usual. The sides, as usual, were good, but couldn't save this dish. Possibly among the weaker items here, skip this. 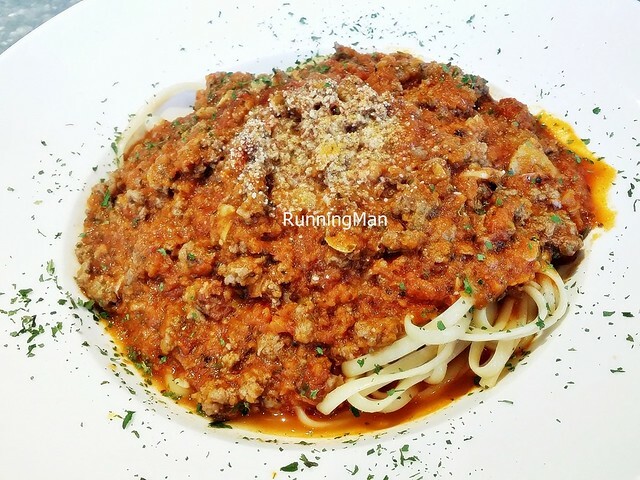 The Pasta Linguine Beef Bolognese (SGD $9.50) here is sub-par, and not worth ordering. The linguine is the mass manufactured variety without much taste, and it hasn't been strained properly, creating a watery base at the bottom of the dish. At least the beef bolognese sauce is meaty and tasty, with a generous amount of minced beef and fresh tomatoes in the sauce. Not a great dish.